• This female bear was great at catching salmon, not great at sharing though. Out of 15 fish she caught, she didn't give a single one to the cubs. Teaching them to fend for themselves I guess. In 1975, The U.S. Fish and Wildlife Service listed the brown (grizzly) bear as a threatened species in the Lower 48 states, under the Endangered Species Act, meaning it is considered likely to become endangered. In Alaska, where there are estimated to be over 30,000 brown bears, they are classified as a game animal with regionally established regulations. Brown Bears reach weights of 300-1500 pounds. The coat color ranges from shades of blond, brown, black or a combination of these; the long outer guard hairs are often tipped with white or silver giving it a grizzled appearance hence the name. 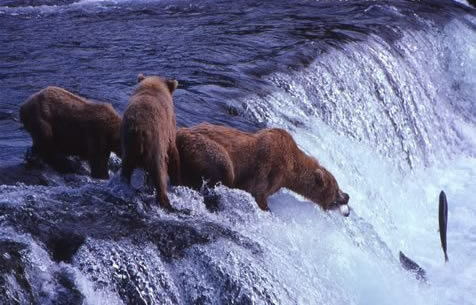 The brown or grizzly has a large hump over the shoulders which is a muscle mass used to power the forelimbs in digging. The head is large and round with a concave facial profile. In spite of their mass size this bear runs at speeds of up to 35 mph.